All metrobus stops have an iPoint at the stop, or nearby. An iPoint is a combined ticket and information point, which can be used to purchase tickets, plan journeys in the Bristol region and view live running information for all onward services that serve the stop. 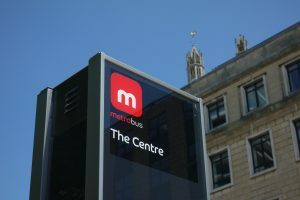 As well as metrobus services, tickets can also be purchased for use on most services in the Bristol region. iPoints are also used by bus operators and the council to communicate important information to the public, such as planned changes to bus services due to road works. If you have a travelwest Travelcard, you can top it up or collect tickets purchased online at the iPoint. If you don’t already have one, don’t worry, as many tickets are dispensed on a Travelcard from the iPoint. 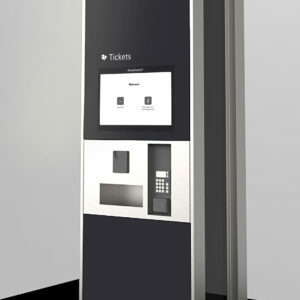 Ticket purchases are made using the touch screen above the ticket tray. When you approach the iPoint, it will be in one of two states depending on how long it has been since it was last used. It will either display a screen with two options (‘Buy ticket’ and ‘Information and journey planning’), or have the ‘Buy ticket’ screen already loaded. Using the journey planner is discussed below. To purchase a ticket, touch ‘Buy ticket’ if the screen is not already loaded. The most common ticket options are listed first, but if you can’t find the ticket you want, simply touch ‘buy other tickets’ at the bottom of the screen, which will allow you to cycle through the various tickets available. If you select a ticket type which is dispensed on a travelwest Travelcard, you will first be asked to ‘Place your smartcard into the holder’ as these can be loaded onto an existing card if you already have one. If you do have one, place your card in the ticket holder below the screen, but if you don’t, don’t worry – simply touch ‘continue’ and a Travelcard will be issued at the end of the purchase, with your ticket loaded onto it. Some ticket types ask you to choose if the ticket will be used immediately. Ensure that you select the correct option. Once you have selected the correct ticket, simply select the quantity and you will be taken to the payment page. If you are paying with card, select ‘card’ and either tap your card on the contactless card reader, or insert it and enter your PIN. If you need more help with using the iPoint, please get in touch. You can view products on your travelwest Smartcard and collect purchases made on the travelwest website by visiting any iPoint and placing your card in the side reader. This is situated on the side of the iPoint. Please ensure that you allow a minimum of 2 hours before attempting to collect purchases made online. The journey planner on the iPoint allows you to plan journeys across the Bristol area and is simply a touch-screen version of the travelwest travel planner. All iPoints feature an emergency help point, which is activated by pressing the button on the side of the unit. When pressed, you are given a direct line to a 24/7 control centre and the nearest CCTV to you is directed at the iPoint.